But, as usual, there is a side to this story that most people in Salt Lake County aren't noticing. The actual percentage of people who are underwithholding is 21% (up from 18%). But the number of people who are OVERwithholding is 73%. THAT is the story, in my opinion: almost three-quarters of taxpayers are loaning the government their money throughout the year, simply because they haven't taken the time to run the numbers. Or maybe it's because they like the feeling of getting a refund, come tax time. But as I've nagged said to you before, getting a refund just means that you didn't project properly. You're giving a multi-trillion dollar organization (the federal government) a loan from YOUR accounts, instead of having use of that money throughout the year. If that's fine with you, so be it. But either way, let's not make this decision simply by default, and not planning ahead! That's why it's helpful to have someone in your corner who can help you get the numbers right. If you haven't had a tax planning meeting with us this summer, there's still plenty of time to do so before the end of the year. Don't miss out on the opportunities available to you to save lots of your hard-earned income from the grasping hands of the IRS. And as we are turning the corner into the end of summer, the wedding season is winding down, and I thought I would offer some unsolicited advice for the newlyweds among us, as well as those who have been "seasoned" a bit in their marital journey. Wedding season is almost over. For many of my clients in Salt Lake County, that ship has sailed … but this is a great opportunity to pass on something smart to your children. Or, perhaps you need a refresher for your existing marriage. 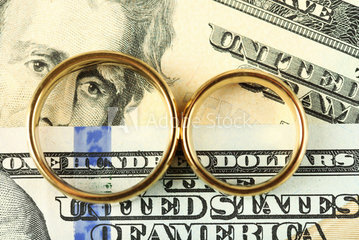 Either way, your marriage is sure to have many challenges, and mastering money is a big one. Expect a few good money fights. "You bought ___ !?" is often the first sign that the dam is breaking and a torrent is about to flow. So that being the case, I've put together a series of exercises which are useful conversations for any engaged couple -- or, even, those with some years under their marriage belt. And because of the length of this, I'll make it a two-parter, and be back with more of these money exercises next week. Begin by separately writing an autobiography that focuses on your relationship to the money you have acquired. The fact is, you've been shaped by experiences with money management, and you picked up most of them through implicit observation. What fears do you have about money? What voices remain inside your head? For example, "I don't want to act like my Uncle Tommy who..." Some voices are helpful and others not so much; be sure to name them all. "Imagine you are fully financially secure, that you have enough money to take care of your needs now and in the future. How would you live your life?" Would you change anything? Let yourself go. Don't hold back on your dreams. Describe a life that is completely and richly yours. Because here's the truth: you can be sure that any unspoken goals will never be fulfilled. You can expect that this exercise might bring about a reprioritization of your time and money. You will find the work of life comes much easier when it is aligned with your passions and aptitudes. Perhaps, for example, you might be led to a downsizing of your lifestyle so you're able to work for that nonprofit you've always had your eye on. In all of my years of working with family finances, I've seen this truth: financial woes often don't come from a lack of income ... but from our failure to live according to our true values. I do hope this helps ... and no matter where you find yourself, there is "no shame in our game". We are in your corner.